The 818 ND is the same but all software for 817 works not or only half. The best is the software 817 Mem but the Memory 1 in the FT818 is Memory 3 in the software. Remote without Memorymanage is the best the software from OM Brown Switzerland. Has anyone modified a European version to allow 60 metre operation? The FT-817 current draw is really a non issue these days with the availability of good LiPo batteries. I have the Windcamp 2500ma units installed in both of my 817s and never lack for power. Not sure why you found the RX audio to be bad either for SWL. The FT-817 has AM mode, and the filter for that mode is 6khz wide. The internal speaker of the FT-817 is adequate but it really sounds good with a good external speaker connected. Oops didn’t notice that I had commented on this before…..
As a dedicated SWL radio with a custom antenna…then probably a little too deaf and not too selective. But, and its a monster but,…as a little rig to throw in your travel luggage then very little comes close. Air-band, Ham bands, SSB and a general coverage receiver all in one little package is truly amazing. Yes the battery is a prob but easily overcome with a little research and bench time. I have taken my FT-817 to the Canaries and several Mediterranean locations and spent many an hour after a night out trawling the bands using a few feet of wire dropped over the balcony as an antenna !! To give you some idea of the transmitting capability of the FT-817…my best QSO so far, 5.6 bothways using a 45 ft longwire, home-brew 9:1 un-un and home -brew Z-Match tuner….into Chicago. 5000 miles using about 4 watts. I wouldnt swap my little magic box for all the Liquid Tanin in the Orient !! The FT-817 makes an excellent SWL receiver. Audio isn’t “Lousy” at all, and the AM bandwidth is fine for most purposes. Audio from the internal speaker is acceptable, but a good external speaker really makes it shine. I have two of them and they are used for everything including BCB dxing and SWL. Not sure that I’d buy one just to get the RX because it does so much more but if you’re already a licensed amateur or an SWL who is thinking about the next step then its a very good choice. I have had several 817s from day one and have enjoyed their portability while travelling and sitting out on the back deck. Adding the BHI DSP unit to the FT-817 also gives a big improvement to its abilities as a receiver. I’ve use an FT-817 for over 10 years now, and the DSP was the best accessory purchase I made. By the way, since batteries and current draw were mentioned by DL4NO, I can also recommend the lithium polymer battery with replacement battery compartment door made by Windcamp (http://www.hamsource.com/WLB-817.html). No only does this 3000 mAh battery provide extended portable service for the radio, the replacement door has an ON-OFF switch to completely disconnect the battery when not used. When switched off, the battery will hold its nearly full charge for months. The BHI DSP is a good addition, especially for broadcast listening: It does not make the signal any better readable, but it reduces the background noise. It helps if you listen to an empty channel for a station coming up. Listening to relatively weak signals for extended periods of time gets much less exhausting. There is a BHI DSP module that can be incorporated into the FT-817. And BHI offers several active speakers with its DSP technology. If you really insist on the FT-817 as a shortwave broadcasting receiver you should prefer an active speaker. As I wrote before: For BC listening the FT-817 audio is lousy. The FT-817 is an amazing rig. I have had one for about 10 years, used it as a mobile station and did CW on holidays, see http://www.dl4no.de/thema/qrp-ante.htm. But I would not consider it as a portable receiver: It is quite heavy (more than 1 kg without power supply). You cannot really operate it with any built-in battery. Its sound quality is lousy and it is relatively power hungry. The biggest problems is the incomplete power shutdown. The final transmitter stages are not disconnected from the battery. Therefore my rig draws some 8 mA from the battery while “turned off”. After a few weeks in storage any internal battery is dead. You get SW receivers that live a lot longer on half as many AA cells and have much better audio. This is an extremely compact amateur radio transceiver and it is intended for a 2.1 kHz bandwidth voice signals. On the plus side: If you travel with a notebook you can easily control it from the computer. And if you travel the world you should be especially careful: In many countries you must not bring any transmitter, even if you are licensed at home. I had looked long and hard at buying one for QRP but opted for it’s bigger brother the 857. 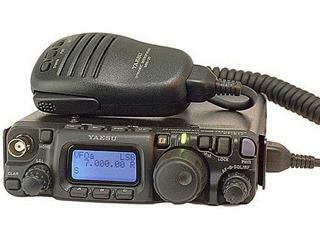 For a rugged reliable radio and, even if only used for RX, the 817 would be a good choice. It’s ability to TX is the icing on the cake. This is another amazing rig but definitely not for portable SWLing. In my car I have had a FT-857 for at least 100,000 km, see http://www.dl4no.de/thema/mobil-st.htm. One big plus side is its tolerance to low supply voltages. This way you can operate it reasonably from a 12 V battery – especially if you buffer it with an 1 F capacitor. You get these quite cheaply as “power caps” from any car audio shop. At 100 W SSB it draws a mean current of about 5 A and during receive it consumes about 600 mA. So a 7.5 Ah lead-gel battery is good for several hours of portable activity.